If a friend forwarded this ezine to you and you like what you read, please subscribe by visiting my subscription page where you can view back issues and see the beautiful inspirational posters that are my gift of appreciation to you. If you want a daily inspirational quote, follow @InspireOasis on Twitter. Since the main events of November are Thanksgiving and Veterans Day, our focus this issue will be on counting our blessings, appreciation for all that we have, and gratitude to our Veterans have sacrificed for our country. We are truly blessed. To gain access to this FREE printable poster (Thanks to our Service Members) with this quote, click here and enter password "posters" (without the quotes). Please be sure to share the poster and quote with your favorite service member or veteran to show your appreciation for all of their sacrifices they have given for our country. The law of attraction is in harmony with this quote. By anticipating and eagerly expecting our good we hasten the process. I challenge you to test this quote out. You’ll be amazed at the results. I really like this quote! True wealth is in the small things often taken for granted, such as good health, 2 arms, 2 legs, mobility, freedom, friends, and family. If we lost any one of these items we would give anything to regain back. We are blessed beyond measure. Expressing gratitude expands your soul and the quality of your life. When you become aware of just how blessed you are you increase your joy. When you let those closest to you know how much you appreciate them you nourish and solidify your relationship. It takes so little to express your gratitude and it pays big dividends in the quality of your life and the lives of those your appreciate. If you want to feel the blessings of God showering your life, develop a thankful heart. The more grateful you are, the more you have to be grateful for. An attitude of gratitude is truly a powerful force that will awaken your awareness of God’s presence and blessings in your life. 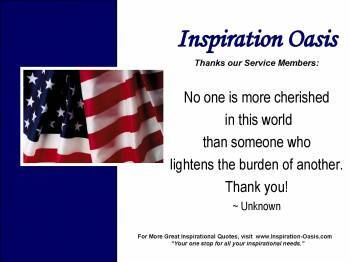 Watch this veteran video tribute was created by Arthur Jones was “voted best” on youtube. This video is in grateful remembrance of veterans who made the supreme sacrifice for the right for freedom and justice. Inspirational music is "Proud to be an American" by Lee Greenwood. Whenever you need a quick motivational video, check out my 3-Minute Motivational Videos page. I’m one who is always looking for reasons to celebrate. Here are some known and little known reasons to celebrate in November! Did you know that the month of November has been deemed as Child Safety and Protection Month? Our children are such a precious asset that deserves to be safeguarded and protected. 11/6/12 – United States Election Day – Get out and vote! I don't know about you, but I'm celebrating 11/30/12 – Stay at Home Because You’re Well Day. We need to take days off when we are healthy enough to enjoy them. Often times, it is life's simplest pleasures that are remembered with the greatest fondness. 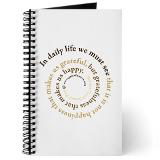 This month's tool for living an inspired life is utilizing a daily gratitude journal. This practice encouraged by the famous celebrity, Oprah Winfrey. "Keep a grateful journal. Every night, list five things you are grateful for." 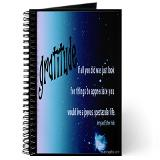 For a larger selection of Gratitude Journals, CLICK HERE. Above are some of my favorite gratitude journals because of the inspirational quotes shown on the cover. I'd love to hear from you. Just reply to this ezine and tell me what you think!